I've posted A LOT of healthy vegetable recipes lately (or at least thats how it feels) so I think it's time for something different and sweet and tasty! ***DISCLAIMER: This is not a health food. This recipe should be used as a special treat. Treats are foods you eat on occasion while the majority of your food should come from beans, vegetables, unprocessed whole grains and/or potatoes, and some fruit.<strong> </strong>This recipe will not heal any chronic diseases but it won't make you sicker (As long as you don't over do it. This is a calorically rich dessert that contains healthy yet dense ingredients like dates, nuts, and chocolate). That being said this dessert is much healthier then commercially processed candy bars that make you SICKER. *** This dessert will hit that sweet spot on your sweet tooth every time! These vegan snickers bars are large and in charge and probably count for at least half a meal so remember moderation when it comes to eating indulgent desserts like this or when eating anything! My patients always want to know how much they can eat of certain foods. Well it all depends on what the item is, how active the person is, etc. Bottom line, skinny or healthy or skinny-healthy people don't over eat or over indulge. You shouldn't eat to much of anything to the point of feeling uncomfortably full! Just because a food is healthy doesn't mean you should over indulge. I know, it's hard and I'm speaking from a place of understanding. My trick is to make these and then send them to work with Jason. Cause we all know that at the end of the day it doesn't matter how much self-control you thought you had... you're done. Pulse oats and cashews in a food processor until smooth. Add dates and pulse until a ball of nougat has formed. Transfer nougat to a small loaf pan lined with parchment paper and press into a square about 1/4 inch thick. Place in the freezer for 5-10 minutes to firm up before slicing. In a small bowl mix peanut butter, maple syrup, vanilla, and coconut oil (optional) together until smooth. Remove nougat from the freezer and slice into 10 king sized snickers bars. Place bars onto a baking sheet lined with parchment paper. Make sure there is space between each bar. 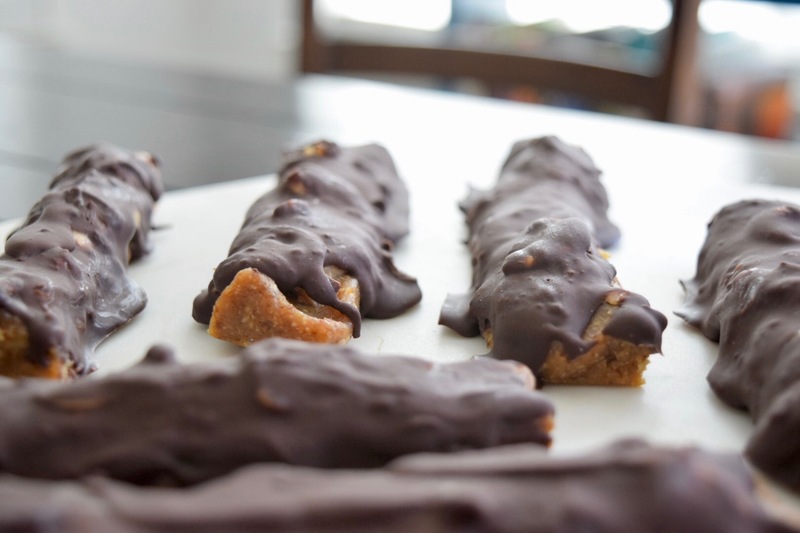 Coat each bar with peanut butter filling and top with peanuts. Pop back into the freezer for 15 minutes to harden. Melt the chocolate over medium heat in a small sauce pan, stir constantly, and add coconut oil. When chocolate has melted remove bars from the freezer and using a spatula paint the chocolate onto each bar covering the peanuts and nougat. Place bars back onto the baking sheet lined with parchment paper and place pan back into the freezer to set for 4 hours. Store in the freezer or fridge to keep fresh until serving. ENJOY! Have pinned these to try later ~ they look seriously tasty! I am so happy you like them!!! IN GOD WE MUST TRUST, WHO ELSE IS THERE?